Be the first to share your favorite memory, photo or story of Robert Ray. This memorial page is dedicated for family, friends and future generations to celebrate the life of their loved one. 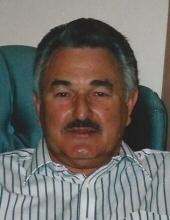 A Bloomfield resident, Mr. Robert Ray “Bobby Ray” Burgin, age 78, passed away Sunday, November 4, 2018 at his residence. He was born October 23, 1940 in Nelson County to the late Roy and Auda Goff Burgin. He was a retired truck driver for Regal Oil Co., the owner of Burgin Service Center in Fairfield, a former millwright, a United States Army Veteran, and a member of Bloomfield Baptist Church, Whiskey City Cruisers, and the Bloomfield American Legion Post 288 where he was the oldest member. Bobby Ray loved his family and to socialize. Along with his parents, he was preceded in death by 3 sisters, Dorothy Carol Burgin, Margaret Elizabeth Burgin, Sue Green, and 4 brothers, John Lloyd, William Roy, Ted, and Beverly Burgin. He is survived by his wife, Janet Hagan Burgin, 3 sons, Joe Burgin of Bloomfield, Tony (Donna) Burgin of Bardstown, Jerry (Stephanie) Burgin of Chaplin, 2 brothers, Gene (Diane) Burgin of Louisville, Tommy Burgin of Oklahoma, 6 grandchildren, Joey (Julia) Burgin, Tabitha (CJ) Taylor, Beth (Brandon) Cheek, Amanda Burgin, Nikki Burgin, Katie Burgin (Matthew Hutchins), and 9 great grandchildren, Shane Burgin, Brock Taylor, Maegan Taylor, Ashlyn Taylor, Braxtan Cheek, Brinley Cheek, Kinslee Curtsinger, Kason Lloyd Burgin, and Michala Stillwell. Funeral services for Mr. Bobby Ray Burgin will be 12:00 noon Wednesday, November 7, 2018 at the Houghlin Funeral Home in Bloomfield. Bro. Leland Parks and Dr. Matt Thompson will officiate. Interment will be in Maple Grove Cemetery. Visitation will be Tuesday from 3:00-8:00 pm. The Houghlin Funeral Home of Bloomfield is in charge of arrangements. To send flowers or a remembrance gift to the family of Robert Ray "Bobby Ray" Burgin, please visit our Tribute Store. "Email Address" would like to share the life celebration of Robert Ray "Bobby Ray" Burgin. Click on the "link" to go to share a favorite memory or leave a condolence message for the family.